This pot is made up of Pot of Greed and Pot of Riches. This is one of two cards that has randomization as part of a cost, the other being Jowgen the Spiritualist. 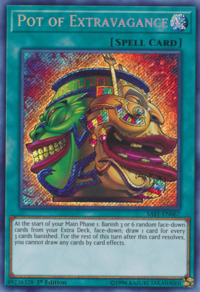 This is the first card that requires the banishment of face-down cards from the Extra Deck as cost for its activation.